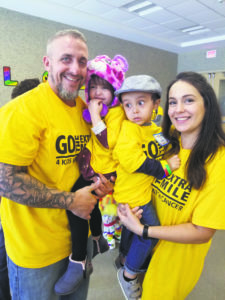 Moms and dads came with their children to the Town of Oyster Bay Hicksville Athletic Center, home of The Morgan Center, to “Go The Extra Mile 4 Kids With Cancer” last Monday, Sept. 24. Adorned with yellow balloons in honor of September being National Childhood Cancer Awareness Month, the athletic center’s gym was a hub of support and solidarity for The Morgan Center families who are battling pediatric cancer. The walk was a kick-off celebration for the center’s new school year, welcoming both families from previous years and families enrolling their child for the first time. 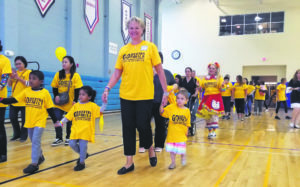 Nancy Zuch, co-founder of The Morgan Center, held hands with the children as they walked four laps around the gym to represent a mile. The Morgan Center was co-founded in 2003 by Zuch and her husband, Rod, in honor of their daughter Morgan who underwent treatment for acute lymphoblastic leukemia when she was just two-years-old. 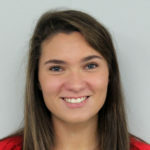 The current Marist College junior founded the center’s Go The Extra Mile walk four years ago. Children ages 2 to 5 who are battling cancer come to the center to socialize, play games, make crafts and learn the basic skills they’ll need for kindergarten. This three-morning-per-week service is provided to families free-of-charge and, recognizing that children with cancer have compromised immune systems, welcomes siblings who are of the appropriate age to attend as well so they don’t bring home germs from another preschool. As part of the mile event, Team YOLO (You Only Live Once), composed of more than 70 women—after starting with just three people—who compete in obstacle courses and athletic races to raise money for children with serious illnesses, walked and trained for their upcoming City Challenge Race in New Jersey. A major benefactor for The Morgan Center, Team YOLO has raised more than $100,000 for the center’s activities. After completing the mile, parents gathered in the community room and looked on as their children enjoyed songs and guitar playing by one of the center’s teachers. A craft followed the sing-a-long, and each child was invited to take home a few toys donated to the center by the Lexiebean Foundation, an organization that supplies care packages and financial aid to pediatric cancer families. “[The Morgan Center has] given her new friends that are like her, also friends that don’t have hair like her. It’s given her something to look forward to, a purpose to wake up every morning, get dressed, get her stuff ready. 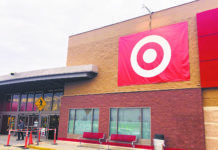 It’s just made her feel like a regular kid,” said Jennifer Tarazona, whose four-year-old daughter, Olivia, has been fighting acute lymphoblastic leukemia, just as Morgan Zuch did, since November. As the activities winded down, families were all smiles as they enjoyed lunch. 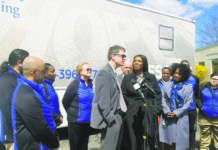 “Any reason to pull these families together and have a celebration is really important,” Zuch said. To learn more about The Morgan Center, visit www.themorgancenter.org.